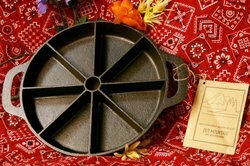 Old Mountain Pre-Sliced Cornbread Pan - Pre-sliced, and pre-seasoned is this genuine Old Mountain cornbread pan. Great for individual servings of cookie batter when camping. Heavy quality cast iron. Measures 11" x 9".